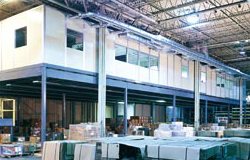 By placing modular offices on a mezzanine, vision towers or observation decks can be created. These platforms provide supervisors a clearer view of the work area while creating additional workspace and maximizing the floor space flexibility below. PortaFab can supply the entire modular building system, mezzanine and stair structure from design and construction to installation. Space under the structure can be left open or enclosed to create multi-level spaces suitable for offices or other specific uses. Vision towers can also be created by combining a PortaFab modular building with a mezzanine system.